Coaster Photo – Adams is especially excited about the possibilities of the Berkeley Oceanfront Hotel’s new rooftop observation area with its spectacular views of the oceanfront and surrounding area. Chris Adams spends a lot of time in hotels. As the interim manager of the Berkeley Oceanfront Hotel in Asbury Park, the North Carolina native is taking care of business day-to-day at the city’s oldest and largest hotel until a full time manager is named. Adams arrived in Asbury Park in early June after similar stints in Austin, Detroit and Atlanta. Hired by hotel owner Amsterdam Hospitality Group, Adams arrived at the busiest time of the year at the Berkeley. “It’s wedding season now,” he said, and since his arrival there have been eight weddings at the Berkeley which has the largest ballroom in the city, the Crystal Ballroom which can handle up to 300 guests. Adams said his first challenge was to stabilize the staff of 75 who take care of the Berkeley’s 238 rooms and suites. The hotel recently reopened the restaurant on a limited basis, serving breakfast on weekends and an all-day light menu which Adams called a “good and necessary option.” Food service for weddings and other large events at the Berkeley is handled by an outside caterer who handles everything from cooks and servers to dishwashers. Adams is especially excited about the possibilities of the Berkeley Oceanfront Hotel’s new rooftop observation area with its spectacular views of the oceanfront and surrounding area. 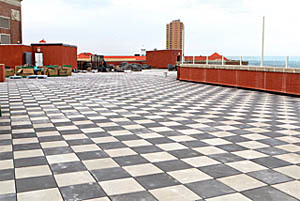 “It’s always 10 degrees cooler up on the roof than on the ground,” he said, adding there are plans to enhance the area. But once summer ends, the Berkeley Oceanfront Hotel’s focus will shift to attracting more corporate and government meeting business. There will always be weddings, but the hotel has a three person staff working to identify ways to increase business in those areas. Adams said he was unfamiliar with the Asbury Park area when he arrived, but has since set off on a mission to learn all he can as fast as he can. He doesn’t have a car, so he’s been walking the boardwalk to downtown and taking advantage of the Free Ride service available during the daylight hours. His walking also took him to Ocean Grove for a service at the Great Auditorium. He also attended an Asbury Park Chamber of Commerce Business Card Exchange to meet other members of the business community. Adams has discovered that Asbury Park has a rich history with its many Victorian homes and the Berkeley Oceanfront Hotel, which opened in 1925 as the Berkeley Carteret Hotel, is one of the more unique places he’s worked. Adams said his biggest surprise was discovering a hidden staircase in the hotel from his ground floor office to the third floor room he’s occupying during his stay.